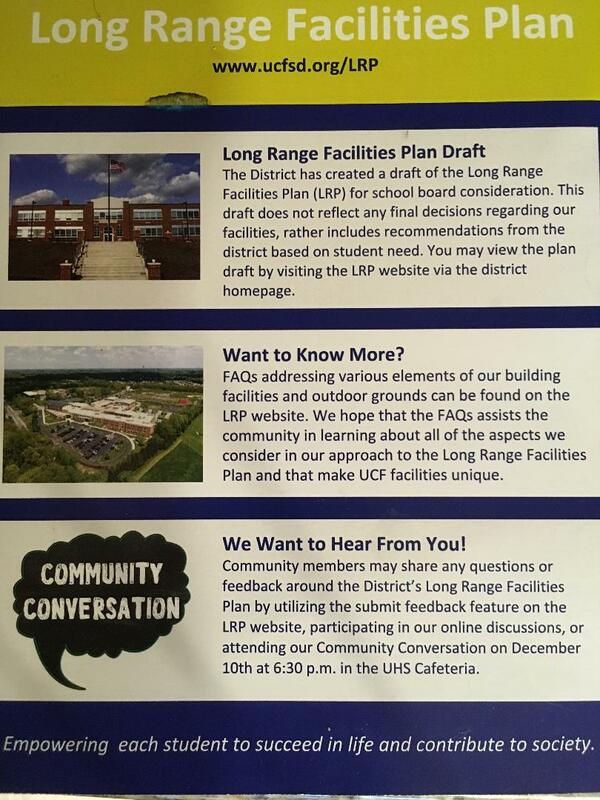 A postcard sent to residents about the proposed facilities plan. This past spring, the Unionville-Chadds Ford School Board hired a consultant to recommend the best use of roads, parking areas, and athletic facilities located on the high school, middle school and Unionville Elementary campuses (the Grounds Plan). Since then, the proposal has been discussed and dissected. Many community members contributed their thoughts. The board always considered the presentation as a work-in-progress. After studying and listening to input, they planned to approve all, some, or none of the projects. Last night’s work session indicated that the board agrees generally on adding two additional artificial turf fields. But instead of placing them by Doe Run Road as per the original proposal, there is interest in installing them by the middle school (in place of 3 grass fields). Supervisor of Buildings and Grounds James Whitesel suggested possibly moving the tennis courts to the rear parking lot of the high school. Keeping all artificial turf fields and tennis courts by the schools would enable current building facilities to be used. The District could then investigate adding more parking in the front of the schools. Whitesel is also requesting a traffic study of Route 82 in front of the middle and high schools during school start and end times. This information will be used to better determine the need for revisions to the traffic pattern and parking. The $8,950 study will be voted on at next week’s board meeting. Over the past few months, many residents expressed concerns that field renovations and expansions may not be necessary if it weren’t for outside community sports groups that utilize the grounds. Answers for requests to know how much the district receives for field “rent” have been somewhat nebulous. It appears they are not always charged. Board member Vic Dupuis addressed this in his closing comments. For example, the Unionville Recreation Association (URA) donated over $46,000 for new scoreboards this past February. There is a community meeting planned on December 10th at 6:30 in the high school cafeteria. The Administration and board is seeking questions and comments from residents regarding the Grounds Plan. There is also a website where residents can learn about the plan and submit feedback. To date, over 350 comments have been fielded. Partly due to that feedback, many parts of the project are no longer in consideration, such as the track field house or the widening of the school access street by Doe Run Road. Whitesel presented a first draft of the ten-year Long-Range Facilities Plan. As borrowing for the first three years of projects would have to occur by early spring, only years 2019, 2020, and 2021 are fleshed out. He advised that except for ballfields safety nets ($150,000), no parts of the Grounds Plan are included until year four, where there is a $400,000 placeholder for artificial field ground preparation. “Make no mistake about it, the next three years is about maintaining and improving our existing facilities,” Whitesel assured the Board. He also reiterated that each year, projects will need to be put out for bid and individually approved by the board, allowing for more changes and discussion. Years one through three include more usual items such as duct work, track and field resurfacing, HVAC replacement and bathroom renovations. In other news, Director of Technology Justin Webb requested approval of a web and email monitoring system to be used with middle and high school Chromebooks. The state requires that schools track student web searching and emails on school devices, looking for trigger words that could indicate that a student may be in trouble or intending harm. Currently, District personnel spend time during working hours reviewing activity, of which 98% of the cases are completely innocent (for example, a student could be searching on the word “gun” for a research project). At a cost of under $8,000 for an eighteen-month contract, the company Securely 24 would monitor activity 24/7 and contact District personnel—day or night–within three minutes of what they deem is a credible risk. A rainbow as seen above Unionville Elementary School as posted by the district on its Facebook page. Lastly, due to financially necessary format changes to The Times, I am sorry to say that this is my last report. In January, The Times is moving to a community submission content model due to declining ad revenue. School taxes represent the lion’s share of property taxes we pay. Residents have a voice—sometimes greater than you think. In the year that I have covered the board for The Times, I have seen policies transformed based on comments and recommendations from the few people who attend the meetings. See what is happening with the Grounds Plan? I hope our readers will keep up-to-date and involved with the actions of our School Board via meeting attendance, the board meeting videos and through the other local news outlets.